Adding to its industry leading array of winches for off-roading and vehicle recovery, Warn Industries today launched two new lines of powersports winches that provide premium components and unequaled performance. The WARN(R) ProVantage and WARN Vantage lines, intended for both ATVs and Side x Sides, include a total of 12 new products. 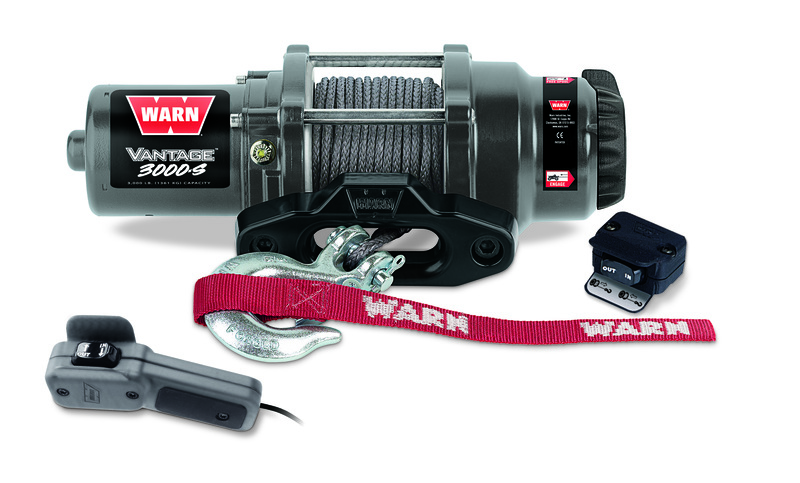 Warn Industries was the first company to introduce winches designed specifically for powersports applications back in 1988. 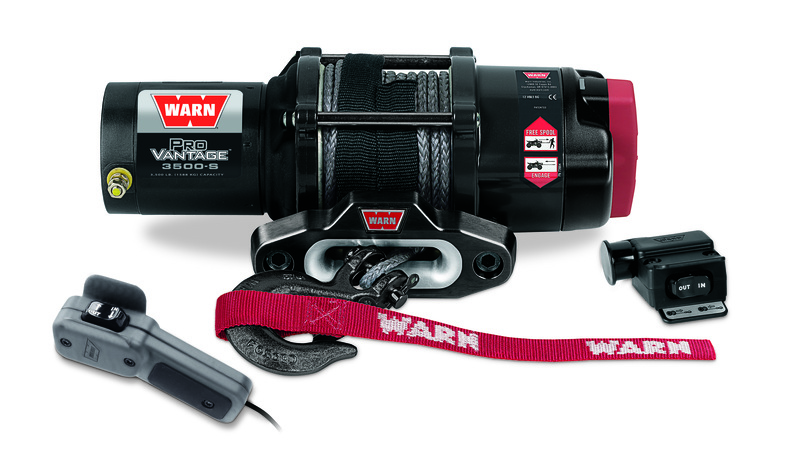 Those looking for the ultimate powersports winch need look no further than the WARN ProVantage lineup. Available in capacities ranging from 2,500 lbs. to 4,500 lbs. and a choice of durable aircraft-grade wire rope or lightweight, easy-to-handle synthetic rope, these winches are built using premium components and offer market-leading performance and features. ProVantage winches features a powerful permanent magnet motor, a smooth, reliable three-stage planetary gear train and metal gear housing, an easy-to-use clutch control dial, full sealing to keep the elements out, a patented roller disc brake for excellent control while winching, and a corrosion-resistant black powder-coated finish with a unique black hook and tie rods. These winches have a Limited Lifetime warranty on mechanical parts and a three-year warranty on electrical components. — ProVantage 2500: 50′ of 3/16″ aircraft-grade wire rope and unique plow roller fairlead for reduced rope wear. — ProVantage 2500-S: 50′ of 3/16″ lightweight, easy-to-handle synthetic rope and attractive double powder-coated hawse fairlead. — Mini rocker control switch with plug for corded remote (remote sold separately). — ProVantage 3500: 50′ of 3/16″ aircraft-grade wire rope and unique plow roller fairlead for reduced rope wear. — ProVantage 3600-S: 50′ of 3/16″ lightweight, easy-to-handle synthetic rope with attractive double powder-coated hawse fairlead. — Corded remote and mini-rocker control switch with integrated socket. — 4,500 lb. capacity–the highest in the WARN powersports lineup–and specific for Side x Sides. — ProVantage 4500: 55′ of 7/32″ aircraft-grade wire rope (the longest in the WARN powersports winch lineup) with unique plow roller fairlead for reduced rope wear. — ProVantage 4500-S: 50′ of 7/32″ lightweight, easy-to-handle synthetic rope with attractive double-powder-coated hawse fairlead. — Includes illuminated dash-mounted control switch and corded remote. WARN Vantage powersports winches offer class-leading performance, affordability, and capacities from 2,000 lbs. to 4,000 lbs. All WARN Vantage winches are available with either durable aircraft-grade wire rope, or lightweight easy-to-handle synthetic rope. Features include fully sealed permanent-magnet motors and planetary drivetrains, high-strength composite gear housings, and a five-year warranty on mechanical components, and a one-year warranty on electrical items. — 2,000 lb. capacity–great for smaller ATVs. — Differential planetary gear train provides excellent performance and a self-locking brake. — Vantage 2000-S: 50′ of 5/32″ lightweight, easy-to-handle synthetic rope with powder-coated hawse fairlead. — Includes handlebar-mounted mini rocker control. — 3,000 lb. capacity–great for bigger ATVs and Side x Sides. — Reliable three-stage planetary gear train and mechanical spring brake for great control. — Vantage 3000-S: 50′ of 3/16″ lightweight, easy-to-handle synthetic rope with powder-coated hawse fairlead. — Includes handlebar-mounted mini rocker switch and corded remote control. — 4,000 lb. pulling capacity–specifically designed for the extra weight of a Side x Side. — Vantage 4000: 55′ of 7/32″ aircraft-grade wire rope and a roller fairlead. — Vantage 4000-S: 50′ of 7/32″ lightweight, easy-to-handle synthetic rope and a powder-coated hawse fairlead. — Includes dash-mounted control switch and corded remote.